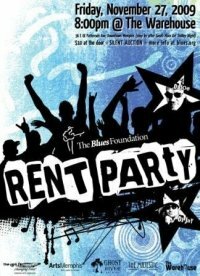 The big thing going on Downtown tonight is the Rent Party fundraiser for the Blues Foundation, at The Warehouse at Front and G.E. Patterson. $10 cover gets you food from the Majestic Grille, Ghost River beer, and Jay and Joe spinning blues tunes. There will also be a silent auction and Blues Foundation merchandise for sale. It starts at 8 PM. Also in the South Main district tonight, it’s Trolley Tour. Many of the galleries and shops of South Main will be open from 6 to 9 PM tonight. Who cares about Black Friday at the mall? Come support some local businesses and shop at a decent hour. Many of the galleries put out wine, beer, and appetizers to encourage patrons to stay a while and look around. Free food? Wonder if the Nuh-Uh Girl will show up. In other news, I see that Republic Nightclub is making a special one-week-only change to their Friday entertainment lineup. Usually they feature Jello wrestling on Fridays, but tonight they’re going to have Thanksgiving pie wrestling instead… come watch hot girls wrestle in turkey day leftovers. Nice. As planned, I spent most of the daylight hours on PokerStars yesterday. I decided to play $6.50 buy-in turbo tournaments, which have 5 minute blinds each… I figured they’d more closely approximate the number of hands per blind level that I’d find at live games, like the Monday night ones at the Goose. I entered 5 tournaments. In one I busted out because I never got good cards. In another I busted out because I made a stupid decision to call an all-in early in the tournament. 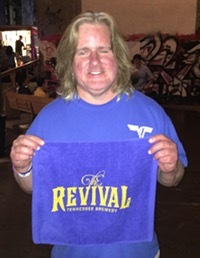 However, in the other three I won first place, putting me up more than $52 for the day and reversing the disastrous Sunday a couple of weeks ago when I took the netbook to Calhoun’s and basically served as an ATM for other poker players. While I was at the Saucer last night, I saw them put next week’s “buy the beer, keep the glass” glass on the chalkboard… it will be a Ghost River glass next Wednesday. I stopped buying beer glasses some time ago, but I guess I’ll have to get one Wednesday since Ghost River is the home team. More PokerStars today… will probably hit happy hour at the Saucer around 4, then Trolley Tour, then the Warehouse party.